Aug. 30, 2014 (San Diego) About 60 people from different walks of life came to the “Officer Jeremy Henwood Memorial Park” in City Heights, behind the Weingart Library and Performance Annex. The goal of the meeting was to remember those who’s “lives were stolen” by the action of the police. The police are using military grade weapons against people who are exercising their rights to protest. She added, “the police are reactionary, and their tactics are to use force rather than not use force.” She added that the police is not trained not to use force. Mendonca also explained some of the issues that people deal with regularly. She said that the officers have zero tolerance policies in schools, as well as curfew policing, to funnel the children into the system early. She also said that the children have rights under the Constitution, but the officers are not going to remind the children about those rights, nor are the children taught them early. In her view, children are swept into the system early, and parents at times have to pay for special diversion classes. The community of City Heights is lower middle class, and $500 is a lot of money. As far as gangs, she also explained that the standards for law enforcement to link a young person to gangs is very low. Therefore it is easy for youth to enter the system that way. Mendonca also does not encourage a relationship with the police because the police cannot be trusted. 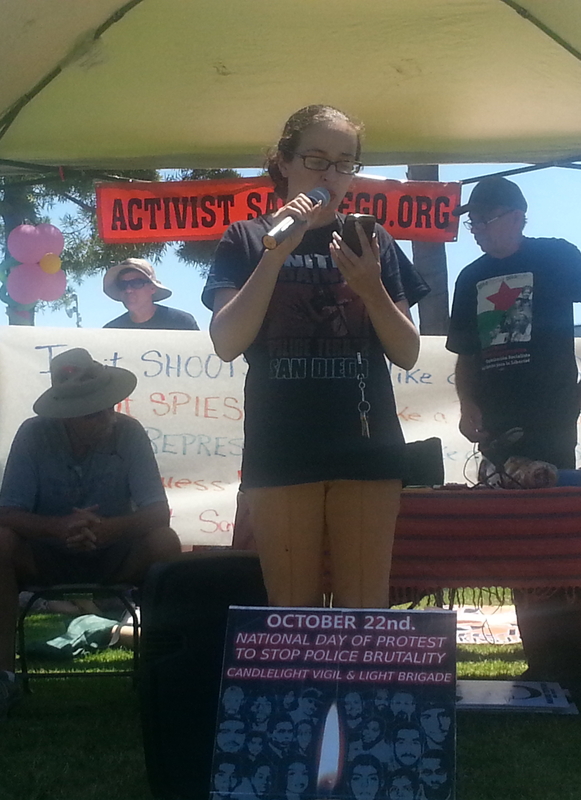 Part of the reason is that her group, Stop Police Brutality, has been able to find 180 victims in San Diego so far. San Diego has a history of tension between communities and the police. One event that led to the establishment of the Civilian Review Board back in 1992, was the Sagon Penn case in 1985. Although Mr. Penn did not testify, jurors heard taped statements that he made shortly after he was arrested. At that time he said he pointed the gun at Officer Jacobs in hopes of getting the officer to stop hitting him, and that the gun went off when the officer hit him in the arm. The case provoked angry denunciations from black leaders, who accused the police department of insensitivity to minorities. While the case at the time did not lead to the conviction of Penn, it did lead to a lot of tension during that summer. But the tensions remained in the community. After some time, a civilian review commission was born, in 1989. The commission that was envisioned and what exists today are very different. As “Arrow” pointed out, The commission “it does not really work.” One of the reasons he said that it does not work, is the fact that it has no subpoena power, no actual review power, and the civilian commissioners need to rely on the Police Internal Affairs Department. This makes it almost useless, and more for show than real oversight. We are including the video testimony in full from Shakina Ortega. Officer Jonathan McCarthy shot her husband in 2011 in Mira Mesa. The American Civil Liberties Union (ACLU) has a manual here, for civilian oversight that you might find useful.